A Temporary Dialysis Catheter Placement radiology procedure is specially designed plastic tubing inserted in a large vein used to perform hemodialysis. The Temporary Dialysis Catheter Placement radiology procedure involves the insertion of a catheter into a large vein, commonly near the neck. Why is the Temporary Dialysis Catheter Placement radiology procedure Performed? What is the Cost of performing the Temporary Dialysis Catheter Placement radiology procedure? The cost of a Temporary Dialysis Catheter Placement procedure depends on a variety of factors, such as the type of your health insurance, annual deductibles, co-pay requirements, out-of-network and in-network of your healthcare providers and healthcare facilities. Frankel A. Temporary access and central venous catheters. European Journal of Vascular and Endovascular Surgery. 2006;31(4):417-422. https://www.sciencedirect.com/science/article/pii/S1078588405006003. Accessed Feb 8, 2017. doi: 10.1016/j.ejvs.2005.10.003. How does the Temporary Dialysis Catheter Placement radiology procedure work? How is the Temporary Dialysis Catheter Placement radiology procedure Performed? The Temporary Dialysis Catheter Placement radiology procedure is commonly performed as an inpatient procedure at a hospital. Depending on the institution, the healthcare specialist who performs the Temporary Dialysis Catheter Placement radiology procedure may be an interventional radiologist or a vascular surgeon. The duration of the procedure may vary depending upon many factors; but, in general, it should take less than 2 hours. The position of the catheter will be confirmed with a chest X-ray by the physician, who performed the Temporary Dialysis Catheter Placement radiology procedure, and confirmed by a radiologist. A physician will request your consent for the Temporary Dialysis Catheter Placement procedure using an Informed Consent Form. Consent for the Temporary Dialysis Catheter Placement procedure: A “consent” is your approval to undergo a procedure. A consent form is signed after the risks and benefits of the procedure, and alternative treatment options, are discussed. This process is called informed consent. What are the Limitations of the Temporary Dialysis Catheter Placement radiology procedure? The Temporary Dialysis Catheter Placement radiology procedure is only suited for a short-term. It does not provide long-term access, such as possible through a fistula or peritoneal dialysis procedure. What is a Temporary Dialysis Catheter Placement procedure? How long will I have this catheter? What is expected during the Temporary Dialysis Catheter Placement radiology procedure? A local anesthetic is normally given to temporarily numb the area. Since the Temporary Dialysis Catheter Placement radiology procedure is a minimally-invasive one, the blood loss involved during the procedure is minimal. 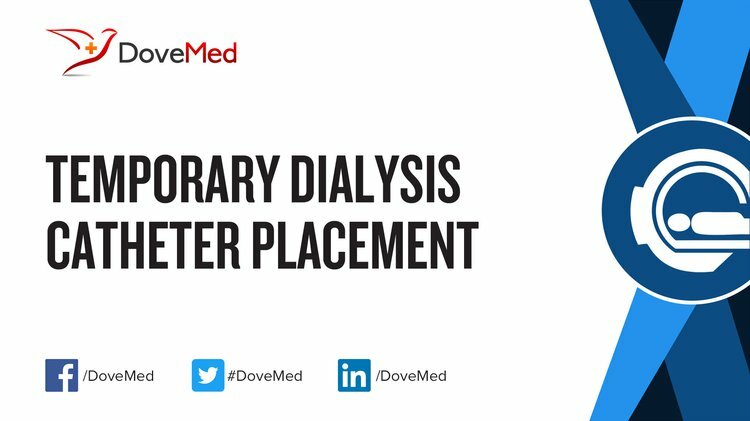 What are the possible Risks and Complications during the Temporary Dialysis Catheter Placement radiology procedure? What Post-Operative Care is needed at the Healthcare Facility after the Temporary Dialysis Catheter Placement radiology procedure? What is to be expected after the Temporary Dialysis Catheter Placement radiology procedure? What Post-Operative Care is needed at Home after the Temporary Dialysis Catheter Placement radiology procedure? The skin at the insertion site may be sore for 1-3 days. The Temporary Dialysis Catheter Placement radiology procedure does not involve the removal of any body tissue. Who will you receive a Bill from, after the Temporary Dialysis Catheter Placement radiology procedure? The patient is advised to inquire and confirm the type of billing, before the Temporary Dialysis Catheter Placement procedure is performed.